A bad craving for Korean spicy rice cakes did this and you can blame (for the umpteenth time) KDrama and how it could easily tantalize me and cause me to make a quick trip to the kitchen to whip up something at that precise moment of madness. If you have a fixation (to KD, that is) like me- you know where I'm coming from. But I don't have the tubular rice cakes so I settled for the sliced ones and made it into something more substantial. 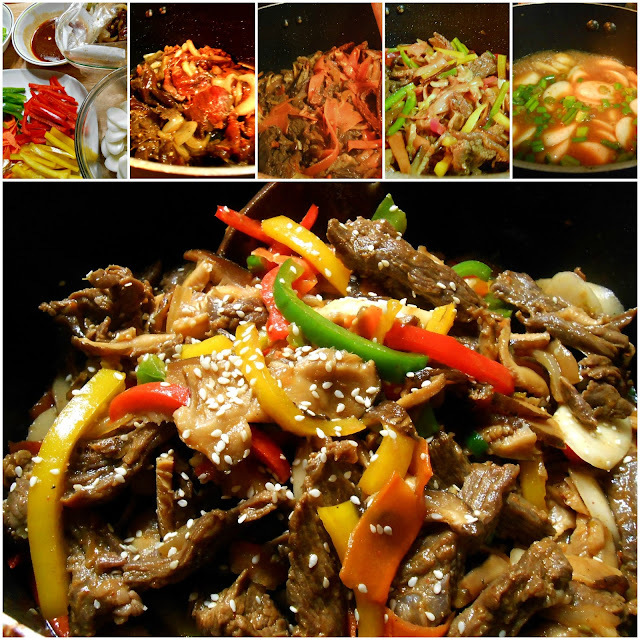 Sliced rice cakes with veggies, meat and spicy sauce equals Spicy Bulgogi Ddukbokki- who can resist that over a bowl of steaming white rice? I work really fast when I'm preparing something out of a craving situation yet there are times when the craving sort of calms down while cooking and I'm just at it for the sole purpose of making a tasty dish but what counts ultimately- my family is pleased and so was me! 1. In a small bowl, whisk together tamari, agave nectar or sugar, toasted sesame oil, minced garlic, white parts of spring onion, hot pepper paste, red pepper flakes and black pepper-set aside. 2. Slice the beef thinly then place in a Ziploc bag with half of the marinade and let stand for an hour. 3. Heat three rounds of canola oil in a pan over medium heat. Sauté the beef for about a minute or two; it should cook fast because of the thinness of the cut. Add mushrooms and sauté for about a minute followed by the carrots and bell peppers for another two minutes. 4. 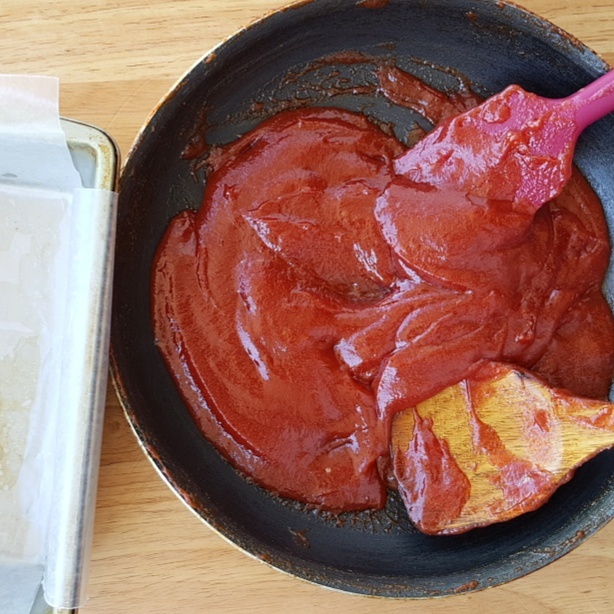 Add about ½ cup of water to the leftover marinade and then add this diluted marinade and the dduk (rice cakes) to the pan. 5. Stir until the dduk softens. The sauce should thicken and a shiny glaze coats the rice cakes. Do not overcook or the dduk becomes mushy as it releases too much starch into the sauce. You may add a little more (hot) water to loosen the sauce if it becomes too thick. 6. Sprinkle the green parts of spring onion just before turning the heat off. 7. Sprinkle with toasted sesame seeds and serve immediately while hot.